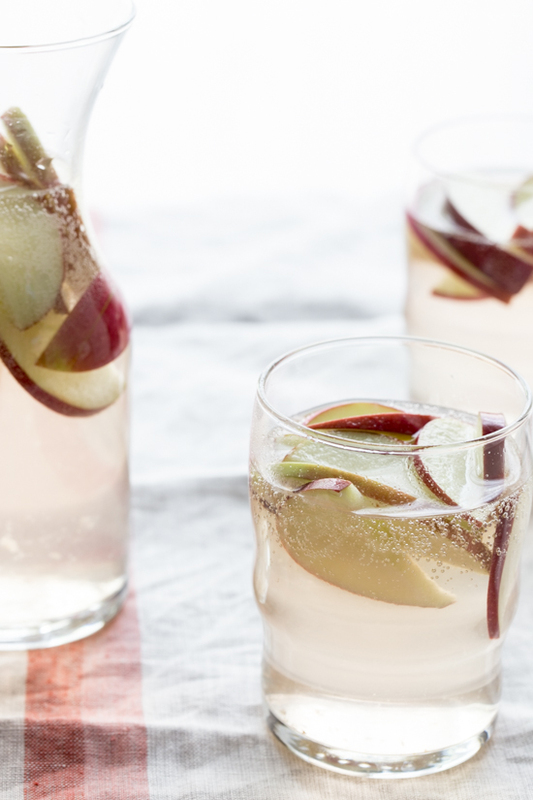 Apple Sangria, anyone? Yes, it’s true. I’m sharing yet another apple cocktail, but can there really be too many easy, scrumptious cocktails in your repertoire? I love having go-to drinks, especially cocktail recipes that will feed a crowd, like this apple sangria. No need for individual mixing of cocktails with this one. Just mix everything together, let the flavors meld, then pour. 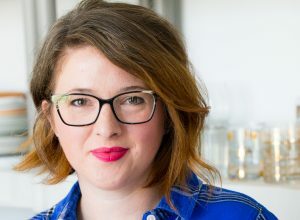 Easy peasy.A couple of weeks ago, I shared my new favorite two ingredient cocktail: spiked caramel apple cider. 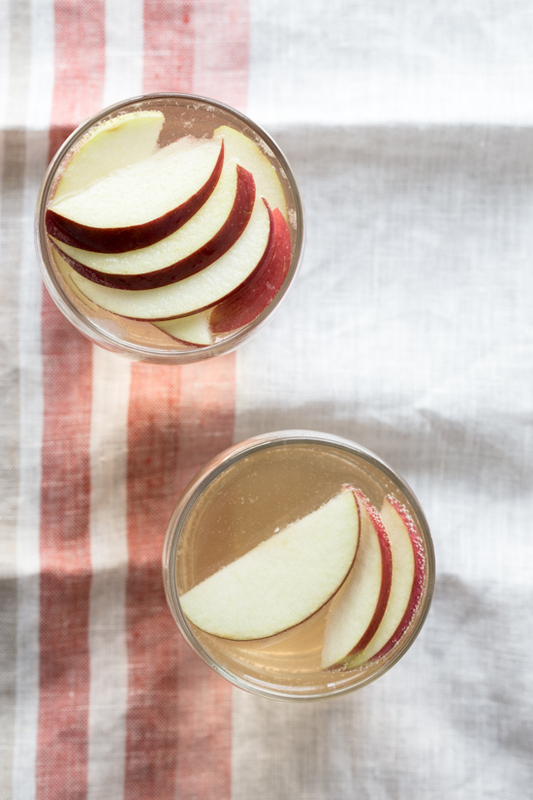 This apple sangria shares a common ingredient with the cocktail – caramel vodka. You see, I had the bottle of vodka and wanted to see what else could be done with it. Perhaps something a bit fancier, yet still easy and fuss free. Sangria was the answer. I love making sangria because it turns good ol’ grocery store wine into something spectacular. In this case, I used white wine, hoping to not overpower the subtle sweetness of the apples and pears. Plus, the very sweet caramel vodka adds so much additional flavor, you don’t need to overdo it with tons of various fruits and spices. A few apples and a pear will do the trick. A touch of club soda adds some sparkle and elevates a very simple drink to a beverage worthy of a special occasion. Bubbles can do that to a drink. I’m thinking of serving this at our family’s Thanksgiving celebration next month. I’m all about make ahead recipes, and there is nothing that is easier to make ahead than a tall pitcher of sangria. I can’t wait for Thanksgiving. But if I’m being honest, it might be because Thanksgiving is the first day that it is socially acceptable to listen to Christmas music. Yes, I’ve secretly been listening to Christmas tunes on Pandora when I’m alone in the car. It’s like I’m a Christmas music junkie. But that’s a problem for another day. Today, we have sangria. Combine wine, vodka, sugar, apples and pears in a large pitcher and stir. Refrigerate for 3-4 hours or overnight. 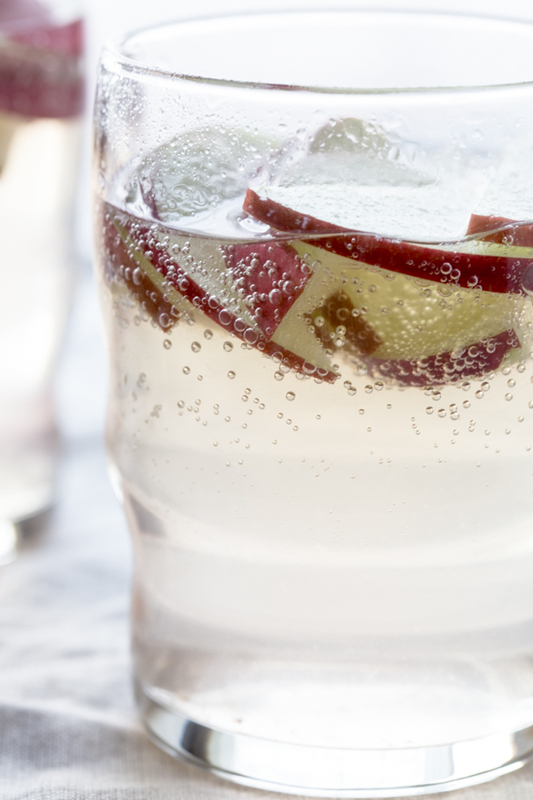 Serve sangria over ice and topped with club soda for a sparkling touch. Enjoy! LOVE this sangria and your photos are absolutely BEAUTIFUL, Emily!! Thank you so much, Kristan!! This looks nine kinds of amazing! Must serve at my next party!! Oh goodness Emily that looks divine. And gorgeous, stunning photos, as always!! Sangria is probably my favorite drink! I just made a version with cranberry juice and pomegranate seeds! I like the idea of caramel vodka in an apple sangria. Would be perfect for Thanksgiving (and very easy to serve)!